The articles published in Journal of Tourism & Hospitality have been cited 15 times by eminent researchers all around the world. Following is the list of articles that have cited the articles published in Journal of Tourism & Hospitality. Rietveld P (2016) Traffic incidents in motorways: An empirical proposal for incident detection using data from mobile phone operators. Steenbruggen J, Tranos E, Rietveld P (2016) Traffic incidents in motorways: an empirical proposal for incident detection using data from mobile phone operators. Journal of transport geography 54: 81-90. Steenbruggen J, Tranos E, Rietveld P (2015) Can Motorway Traffic Incidents be detected by Mobile Phone Usage Data? An Empirical Application in the Netherlands. Research Memorandum. Patwardhan AR (2017) Aligning Yoga With Its Evolving Role in Health Care: Comments on Yoga Practice, Policy, Research. Journal of Primary Care & Community Health. Lajevardi M (2016) A comprehensive perspective on medical tourism context and create a conceptual framework. Journal of Tourism and Hospitality. Esenyel I, Mahafzah AG (2016) The role played by strategic planning in the performance of hotel HR departments: the case of Turkish Republic of North Cyprus (TRNC). Journal of Tourism and Hospitality. Najaf R, Najaf K (2016) An Empirical Study on the Dynamic Relationship between Crude Oil Prices and Nigeria Stock Market. J Tourism Hospit, 5: 2167-0269. Luc M, Tejwan-Bopp M, Bopp C, Szmanda JB (2016) Applying native e-tourism to support the development of sustainable tourism. Journal of Tourism & Hospitality. Abam EN (2016) Marketing a potential tourism destination-a case study of Nsanakang in Eyumojock subdivision. Journal of Tourism and Hospitality. Turdibekov K, Ibragimovich YT (216) RATES OF TOURISM COMPETITIVENESS UNDER THE CATEGORICAL APPARATUS OF TOURISM INDUSTRY THROUGH STRATEGIC FUNDAMENTALS OF FORMATION, ANALYSES OF UZBEKISTAN. Journal of Management Value & Ethics. Pittman J (2016) Learning as we travel: creating the next generation of global educators writing project. Journal of Tourism and Hospitality. Tomazos K (2016) Dr Volunteer and Mr Tourist: lifting the guilt off volunteer tourism. 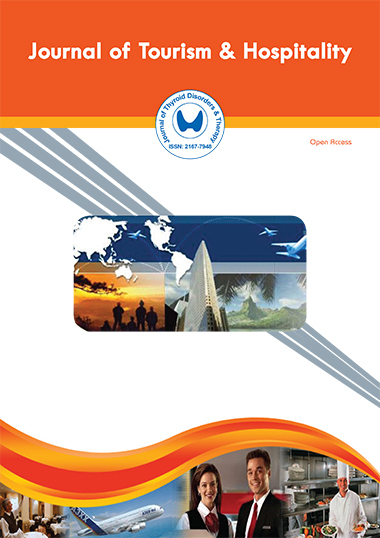 Journal of Tourism & Hospitality. ArtiÄ N (2016) Evaluation of the Innovation Influences and Effects in Hotel Industry. Enemuo OB, Chigozie IG (2015) Evaluation of economic influence of tourism development on the host communities of cross-river national park Nigeria. Journal of Tourism and Hospitality.